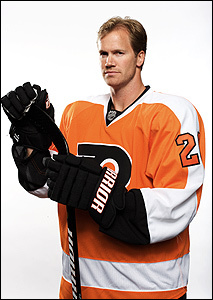 (Voorhees, NJ) – Having spent the majority of his career on the West Coast, Flyers defenseman Chris Pronger got a little taste of what a Wachovia Center crowd can be like on Saturday night when he attended UFC 101. The building was sold out and as loud as ever for the ultimate fighting event. “It seemed like a pretty raucous atmosphere,” said Pronger, who will undoubtedly contribute to that atmosphere once Philadelphia’s home opener arrives on October 6 against the Washington Capitals. The 6’6’’, 214-pound defenseman recently came back to town for good to get settled into a new home with his family and prepare for his 16th season in the NHL and first in orange and black. “Now we’re just going through all the boxes and trying to get situated,” he said. When the trade with Anaheim was made at the NHL Entry Draft on June 26, most top hockey minds said that despite having to surrender a 20-goal scorer in Joffrey Lupul, a top prospect in Luca Sbisa and two first-round picks, the Flyers had immediately made themselves a Stanley Cup contender. After all, Pronger won a Cup with Anaheim in 2007 and led the Edmonton Oilers to the Finals in his one and only year there in 2005-06. Pronger responded to those comments on Monday. “I think when [Burke] got me in Anaheim he was trying to emulate the way Philadelphia has played throughout the history of the franchise,” said Pronger. “We were, I guess, one of those teams that were looked upon by the league as one of the bad boys of the NHL in terms of penalties and whatnot called against us. Pronger is no stranger to getting to camp early. The majority of players typically arrive in late August and early September, but the Flyers’ prized offseason acquisition is already getting himself in shape for the grind that begins with the first on-ice day of training camp September 13. It's a routine he's followed for most of his career. “I’m usually here around this time trying to start skating and preparing for the season, and doing all the little things that it takes to be ready to go for the start of camp. Pronger has gotten a chance to get to know some of his new teammates who stick around town for most of the summer like Jeff Carter and Riley Cote, who went with Pronger to the UFC fights over the weekend. When looking at the current roster, Pronger sees a team that is ready to win now. “I think we’ve got a young, energetic and exciting team that’s going to be fun to watch,” he said. He’s also impressed with the Flyers’ staff and organization as a whole so far.